The Oberoi, Bali boasts beautiful Balinese Lanai rooms, the Oberoi brand's fantastic service and fabulous views from oceanfront gardens. With an atmosphere of soothing tranquillity, you'll feel a world away from the bars and boutiques of nearby Seminyak. In tropical acres by Seminyak’s soft sand beach, with arguably the best beachfront views in Bali. Approx. 30 minutes by private transfer from the airport. 60 traditional Lanais and 14 private Villas, each with air-conditioning, CD/DVD player, minibar, bathroom with sunken bath and either Garden views or views of the Ocean from either the bedroom, terrace or dining pavilion. 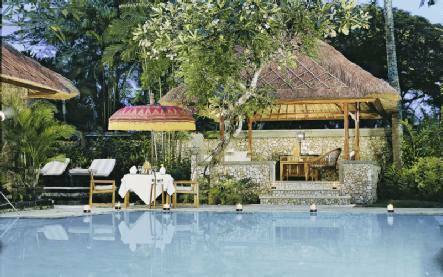 Luxury Lanai Rooms (55sqm) are set in clusters of four around the resort. Luxury Villas (200-400sqm) have a terrace and dining pavilion. Luxury Pool Villas (200-400sqm) each feature a generous garden and oversized outdoor pool. Take an energising yoga class one morning a week before indulging at the spa with a heavenly treatment. Take a dip in the swimming pool by the beach, hit the sea for some boogie boarding and work-out at the fitness centre. Play tennis, be pampered at the beauty salon and hop on the shuttle to Legian. Dine in two delectable restaurants and sip cocktails in the bar, or catch a Balinese show with buffet dinner at the amphitheatre. 2018 Package holidays to the Oberoi Bali Prices are per person based on two sharing.